Commentators across Europe, indeed the world, have marvelled at the ability of the Irish to suffer punishing austerity without strikes, riots and political convulsions. Local commentators have basked in their acclaim as the austerity poster-boy – in damning comparison to those Greeks and other southern Europeans. Instead the Irish voted for a European austerity Treaty and voted in a Fine Gael-led coalition with politics no different from the previous Fianna Fail led one. If opinion polls are to be believed, many have gone back to supporting the utterly discredited Fianna Fail. The recent Meath by-election saw the Fine Gael candidate handsomely returned and the particular local circumstances do not adequately explain it. Irish workers accepted the tearing up of the existing social partnership deal and voted for a new one called Croke Park, which inflicted cuts in services and conditions, including yellow pack terms and conditions for younger workers, in return for no compulsory redundancies. Unemployment however has soared, reaching over 14 per cent officially and, according to the IMF, over 23 per cent if the underemployed are included. This is despite emigration of tens of thousands of the younger generation to destinations across the world. Yet still the ‘fighting Irish’ showed no signs of fighting. 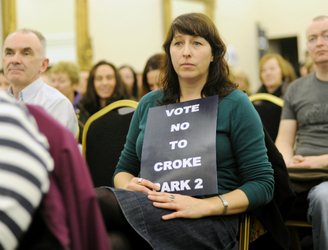 This is the significance of the vote on a new Croke Park deal. Irish workers have said NO. If it has been a surprise to many on our side it has been a shock to the Government who thought their threats, bullying and intimidation would work. Above all they thought the rotten leadership of the Irish trade union movement, which supported the new deal, would pull it through. There is a grain of truth in this but we will come back to this. Let us first note that the press and media betray once again their class character by agonising about how the democratic wishes of the workers can be subverted by ‘tweaking’ the deal to get it through. You will search in vain for commentary deliberating over how the workers’ majority can assert and validate their democratic decision. The deal has been rejected but the vote is a mere inconvenience. It doesn’t count. The workers can say anything they want and will be listened to, but only if they agree. Like European referendums voting is to allow worker s to approve the plans of the capitalist class and its state. Again and again Irish workers are taught this lesson – voting is not a choice, it’s a stamp made of rubber. Instead we are fed rubbish that a vote that saw the deal decisively rejected by a majority of two to one, 115,000 to 55,000, could somehow have been passed “if 1,000 members of SIPTU had voted the other way, or if more of its members had been minded to come out and vote.” The votes of those who didn’t vote are ‘virtually’ counted to support austerity while in fact the vote against will have awakened the many workers who didn’t vote to the possibility of voting against the Government, the State, the mass media and their own rotten leaderships. But even these propagandists of the system couldn’t help but recognise that many workers voted no, not because they were personally affected very badly by the deal, but because they didn’t think they should vote for other workers to take a pay cut. The grain of truth – that the result could have been very different – is a reflection of the bureaucratic nature of the trade union movement, where a majority of 60,000 might be reversed by 1,000 voting differently in the biggest union. This is only one illustration of what is now the biggest question that is to be answered, which is not the one asked in the media – of what will the Government do? The real question is – what will, or can, the workers do about their leaders who recommended and argued for and censored the opposition to this rotten deal? What this episode reveals all too obviously is the restrictions placed on workers by union bureaucracy and this bureaucracy’s intention of relying on the Government to ‘tweak’ the deal so it can be imposed on the membership. It shows the awareness of trade unionists that a strategy is required and one that seeks the maximum unity. The obvious weakness involves relying on the same union bureaucrats to provide this strategy and implement it. Putting together a convincing strategy will not be easy but the vote itself is a massive step forward, as is the appreciation of the need for a strategy and for this to be based on unity within the union movement. Very early on in the current crisis the then Government relatively easily divided workers through claiming those working in the public and private sectors had separate and opposing interests. The union leaders seemed only too happy to walk into this trap. Their willingness to sacrifice services for short-term and increasingly illusory benefits for public sector workers has failed even these workers as their pay has been slashed and the deal they signed up to was torn up with union consent. Meanwhile the workers who use these services have had some confirmation that the quality of these services may suffer to defend the conditions of those who deliver them. The initial reaction against this disastrous approach was recourse to an even more divisive one, with the creation of a Frontline Alliance that saw narrow trade unionism prioritise the interests of some workers who are on the frontline of some services, implying a common interest not shared across all workers. However I’ve yet to meet a frontline service that could operate without the support of rearguard(?) workers. Even this signalled not some reduced form of trade union unity but the plaintive cries of the ‘special case’. I remember listening to an interview some months back on ‘The Last Word’ on Today FM with a group of union leaders from this Alliance. What was most striking was that when they were interviewed one-by-one there was hardly the slightest hint of a common grievance. They seemed totally ignorant of how narrow their complaints seemed and how stupid a strategy is which is based on claiming special treatment when such an all-engulfing attack is being meted out. There are other courses of action and what might seem like alternative courses for workers looking to fight back are in fact the same struggle. The view that it is impossible to get the union movement to fight back without first kicking out its rotten leadership replaces a task on which workers have just voted – rejection of Croke Park 2 – with one they have not had placed clearly before them, debated and decided upon. There is limited traction in simply claiming ‘betrayal’ and saying these leaders must be replaced now before a real struggle to give effect to the No vote can be realised. The entirely justified and valid view that the current union leaders must be replaced can be achieved by demonstrating to the majority of members the practical effects of these leaders supporting attacks on their interests while frustrating any resistance. In the course of mounting this resistance the task of replacing these leaders can be posed but not as a precondition or prior requirement for such resistance. The related questions of whether workers should demand that their leaders hammer out a united strategy or should unite at rank and file level to achieve this themselves are also not opposed. While rank and file workers must unite across unions to create their own structures this can only be in addition to the established ones. In this way they might demand that their separate leaderships take action and also advance towards an end-point where, if they do not, workers are in a position to pose this task practically themselves. In doing so workers might learn that replacing the current leaders is not enough and that what is really required is an entirely rejuvenated trade union movement. One that is open, democratic and not in thrall to either bureaucratic leaders or bureaucratic structures and rules. A big step forward has been taken with the No vote and the Government is faced with the threat of resistance. As this post is finished it is reported that the Government does indeed intend to ‘tweak’ the deal in what is called a “carrot and stick approach”. Since it still intends to make the same amount of cuts what won’t change are the pain and divisiveness of the tweaked deal and the threats that will accompany it. Like donkeys workers are expected to look at a carrot paraded in front of them while what they feel is the stick. Over the last two decades the left has attempted to respond to the heavy defeats of the working class by breaking out of its isolation and creating, or rather supporting the creation of, broad left parties. Similarly sections of society, especially youth, have responded to the obvious unfairness of global capitalism by involving themselves in protests and movements against globalisation. Both of these moves have to one degree or other come under the label of anti-capitalism. It has never been very clear what this anti-capitalism consists of. The left groups have more often than not attempted to create these broad, anti-capitalist parties themselves rather than insert themselves into genuine broad movements. The anti-globalisation movement has also by and large been separated from working class struggle due to the latter’s decline. In the absence of such struggle speculative attempts to create broad parties can have only limited success but this does not account for complete failure. In Ireland we have just witnessed the failure of the United Left Alliance, which follows on the failure of previous initiatives such as the Socialist Alliance. This comes as similar initiatives in Britain such as its Socialist Alliance, Scottish Socialist Party and RESPECT have also ended in failure. To a greater or lesser extent these projects have been based on the idea that there exists a vacuum on the left through the rightward trajectory of social democratic parties which the left organisations can fill. There has been no pause for thought that this movement to the right is a result not of some pathology to betray traditional social democratic politics but results from the assault of right wing forces, consequent defeat of workers and an undermining of the basis for social democratic answers. Much weaker forces from the left trying to occupy this ‘space’ with not dissimilar policies, in the absence of any change to any of these larger factors, could only expect to face a similar evacuation of this ‘space’ – usually through collapse. The invention of the term anti-capitalism that is supposed to sit outside the traditional reformist/revolutionary dichotomy has been the programmatic basis for these initiatives although these take various guises. In this blog I have critiqued the anti-capitalist programme of the left organisations in Ireland as they have grouped themselves around the United Left Alliance. This criticism has examined their programme of debt default, their budget proposals, taxing the rich, state investment and nationalisation. This programme can nevertheless be called anti-capitalist because no pro-capitalist force currently comes anywhere near supporting it. No party supports high taxation of the rich, defaulting on debt or much increased state spending to lower unemployment. The capitalist class would bitterly oppose implementation of these measures, which would be better for the working class than current austerity policies. None of these considerations however make this a working class programme. Capitalist states have defaulted on their debt before – many times; taxation of high incomes was well over 90 per cent in the post-war United States during the cold war; deficit spending by the state has been an automatic result of the current crisis and nationalisation has been a response across the world to the current crisis. In Britain and the US parts of the financial system were effectively nationalised and in Ireland almost all the banks were nationalised. The anti-capitalist policies proposed differ only in degree to those imposed by capitalism many times before. Above all this programme is not a working class one because it does not provide an alternative to capitalism in the sense that working class power is built and strengthened and the germs of alternative relations of production are created. The social democratic programme was evacuated because it was not seen as the best option for capitalism. If the capitalist class or its representatives change their minds about this they will get their own parties, including social democratic ones, to implement it. The anti-capitalist content of this programme is twofold. First it may target particular sections of the capitalist class or its representatives but only to benefit others. Thus debt default will impose losses on sectors of financial capitalism that may benefit industrial/producer sectors. High taxation will hit the highest paid mangers of capitalist enterprises such as bank CEOs, so depressing their salaries, which may be to the benefit of capitalist owners as shareholders. Deficit spending on infrastructure will obviously directly benefit capitalist construction companies while putting pressure on lending to other capitalists. Nationalisation of banks has been a means of protecting capitalist investors, not of expropriating them, but it also maintains the integrity of other capitalist’s liabilities. The second way this programme is anti-capitalist we have explained – the capitalists oppose it. The anti-capitalism of the programme is very like the anti-imperialism of Irish republicanism in the 1970s and 1980s. It was heartfelt and genuine in a subjective sense and involved enormous sacrifice. In an objective sense it was unrealisable by the methods adopted – armed struggle by republicans and electoralism by the left, which means that eventually the means change or the objective is abandoned. In the case of republicans it was both. In both cases neither programme opposed or presented an alternative to the class interests that they fought against. In the case of republicans they never had a programme that opposed and had an alternative to the British and Irish capitalist classes who defended partition. In the case of the left even implementation of their programme would not end the capitalist system or threaten the power of the capitalist state. In fact most of its programme involves strengthening the capitalist state. As I posted before: in one aspect of their programme these weaknesses might be seen to have been mitigated if not overcome. The demand for workers’ control of enterprises taken over by the state might seem to present a means to increase working class power while encapsulating the potential of an alternative, new society. Unfortunately the demand for workers control is proposed as part of the demand for nationalisation as if the capitalist state is in some way a facilitator for the creation of working class power. The Marxist analysis of the state is that when the capitalist class is threatened by working class action it is the state which is strong enough to defend capitalist interests. State ownership is not therefore a route to workers’ control. No aspects of the many forms of state organisation involve workers’ control of any aspect of its bureaucracy. In capitalist society ownership entitles control and capitalist ownership entails capitalist control. State ownership entails state control. Only in times of extreme crisis is the possibility of workers’ control raised and it is raised only when it is imposed by the workers themselves. If they are in a position to do so, and to make it work, the demand should also be for workers ownership. Above all the demand for workers’ control must be posed as a practical demand because it is necessary in order to achieve certain objectives. In the past this has often involved keeping a workplace open when it is threatened by closure. It does not normally arise in workers minds as an objective in itself. Unfortunately this is how it is posed by the left – not as a burning necessity to achieve certain things which only the workers have an interest in accomplishing. It is rarely posed as a practical measure needed to achieve particular objectives. As I posted before in relation to the Transitional Programme, demands must be concrete and practical or they are simply tools of education (when not means of spreading confusion). Nothing wrong with this in itself, if that is where the struggle is at, but for the left the education given creates illusions in the state by demanding nationalisation as the key. The demand for nationalisation under workers’ control fits comfortably within a general programme that is reliant on state action for implementation. These proposals become blueprints, not demands that workers are to impose through their struggle to achieve certain practical needs. Demands that workers exercise control coexist with formulations that are perfectly consistent with bog standard capitalist state nationalisation. Demands for ‘public’ or ‘democratic’ control can be perfectly understood to mean the existing forms of state ownership. “Thus the regime of workers’ control, a provisional transitional regime by its very essence, can correspond only to the period of the convulsing of the bourgeois state, the proletarian offensive, and the failing back of the bourgeoisie, that is, to the period of the proletarian revolution in the fullest sense of the word.” It hardly needs saying that we are nowhere near such a situation today, not in Ireland or anywhere else. We shall examine further the historical experience of workers’ control in a further post.